When you start Excel 2013, the program displays the default startup screen, similar to the one displayed in the following image. Here, you will find a list of recently opened files and the button called Open Other workbooks, which is located at the bottom of the panel. The Right panel shows a list of default templates that are available in Excel. If none of them meets your expectations, you can use the search bar by typing the phrase you want. In this case, Excel will be searching for templates that are available on the Internet. Additionally, below the bar, you will find some of the most popular phrases. When you click one of them, Excel will start searching for templates in this category. To create a new document, click the first item called the Blank Workbook. You can also do this by using the Ctrl + N keyboard shortcut. 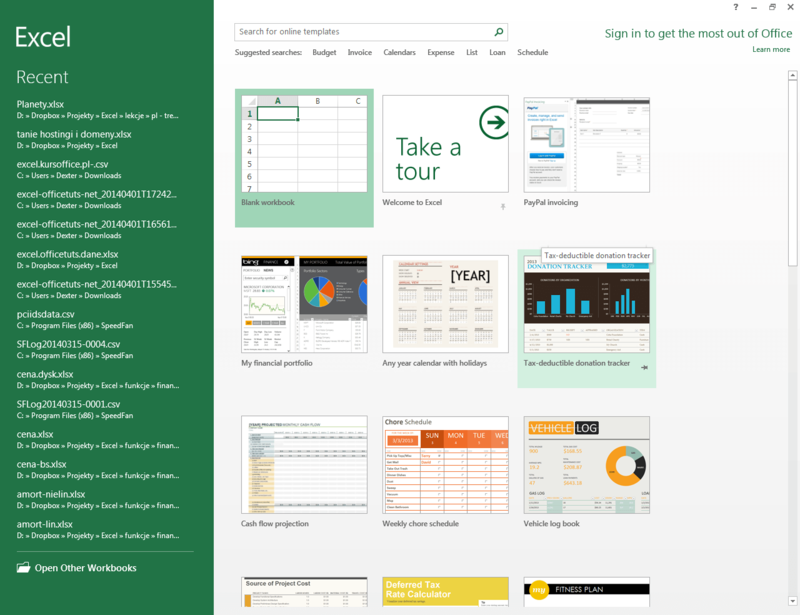 For the first time, the startup screen appeared in Excel 2013 and is, by default, displayed when you start the program. If you want to see a Blank workbook instead, go to File >> Options >> General and uncheck the Show the start screen when the application starts checkbox.